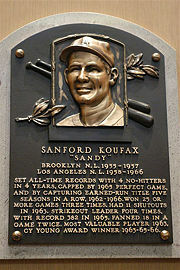 Sanford Koufax (born Sanford Braun, on December 30, 1935) was an American left-handed pitcher in Major League Baseball who played his entire career for the Brooklyn/Los Angeles Dodgers, from 1955 to 1966. He is considered one of the best pitchers ever to have played the game. Koufax's career peaked with a run of six outstanding seasons from 1961 to 1966 before arthritis ended his career at age 30. He was named the National League's (NL) Most Valuable Player in 1963 and won the 1963, 1965, and 1966 Cy Young Awards by unanimous votes. In all three seasons, he won the pitcher's triple crown by leading the National League (as well as the American League) in wins, strikeouts, and earned-run average (ERA). Among NL pitchers with at least 2,000 innings pitched who have debuted since 1913, Koufax has the highest career winning percentage (.655) and had the lowest career ERA (2.76) until surpassed by Tom Seaver, whose NL career mark is 2.73. His 2,396 career strikeouts ranked seventh in major-league history upon his retirement, and trailed only Warren Spahn's total of 2,583 among left-handers. Retiring at the peak of his career, Koufax became the youngest player ever elected to the Baseball Hall of Fame. Koufax is also known as one of the outstanding Jewish athletes of his era in American professional sports. His decision not to pitch Game One of the 1965 World Series because game day fell on the Jewish holiday of Yom Kippur, although controversial, garnered national attention and respect for Jewish religious traditions. Koufax was born in Brooklyn, New York, and raised in Borough Park, Brooklyn. His parents, Evelyn and Jack Braun, divorced when he was three years old. His mother remarried when he was nine, and Sandy took the surname of her new husband, Irving Koufax. Koufax attended Brooklyn's Lafayette High School, where he was better known for basketball than baseball. He attended the University of Cincinnati on a basketball scholarship. In spring 1954, however, he made the University's varsity baseball team. That season, Koufax had 51 strikeouts in 31 innings, and Bill Zinser, a scout for the Brooklyn Dodgers, sent the team a glowing report that was apparently filed and forgotten. Koufax tried out for New York Giants and the Pittsburgh Pirates. During the tryout with the Pirates, Koufax's pitching was so powerful that it broke the thumb of his catcher and Branch Rickey, then general manager of the Pirates, told his scout Clyde Sukeforth that Koufax had the "greatest arm [he had] ever seen." The Pirates, however, failed to offer Koufax a contract until after he was committed to signing with the Dodgers. Dodgers scout Al Campanis learned about Koufax from a local sporting-goods storeowner. After seeing Koufax pitch, Campanis invited him to a try out at Ebbets Field. The Dodgers signed Koufax on a $6,000 salary with a $14,000 signing bonus. Koufax' first game as starting pitcher was on July 6, 1955. He lasted only 4 2/3 innings, giving up eight walks. He did not start again for almost two months, playing at Ebbets Field against the Cincinnati Reds. Koufax threw a two-hit, seven-to-nothing complete-game shutout for his first major league win. The remainder of the season was not as impressive, however. The Dodgers won the 1955 World Series for their first title in franchise history—but without any help from Koufax, who sat on the bench for the entire series. Despite the blazing speed of his fastball, in 1956 Koufax continued to struggle with control problems. He saw little work, pitching only 58.7 innings, walking 29 and striking out 30, with a 4.91 ERA. To prepare for the 1957 season, the Dodgers sent Koufax to Puerto Rico to play winter ball. He performed better during the regular 1957 season, and on September 29, Koufax was the last man ever to pitch for the Brooklyn Dodgers before their move to Los Angeles. Over the next three seasons, Koufax was in and out of the Dodger starting rotation due to injuries. He started the 1958 season strong, but sprained his ankle in a collision at first base and finished the season with an 11–11 record, leading the league in wild pitches. In June 1959 Koufax showed his pitching talent by striking out 16 Philadelphia Phillies to set the record for a night game. On August 31, 1959, he broke that record and tied Bob Feller's major-league record for strikeouts in one game with 18 strikeouts against the Giants. The Dodgers won a close pennant race against the Milwaukee Braves and the San Francisco Giants and went on to face the Chicago White Sox in the 1959 World Series. Manager Walter Alston gave Koufax the start in the fifth game, played at the Los Angeles Coliseum in front of 92,706 fans. Koufax allowed only one run in seven innings, but was charged with the loss when the game ended 1-0. However, the Dodgers came back to win the Series in Game Six in Chicago. However, Koufax was still not living up to his potential. In early 1960, Koufax asked Dodgers GM Buzzie Bavasi to trade him because he felt that he was not getting enough playing time. By the end of 1960, after going 8-13, Koufax was thinking about quitting baseball to devote himself to an electronics business. Koufax showed up for the 1961 season in better condition than he had in previous years. During spring training, he worked to correct a hitch in his windup which obstructed the target. That season, Koufax finally broke into the starting rotation permanently. On September 27, he broke the National League record for strikeouts in a season, surpassing Christy Mathewson's mark of 267, set in 1903. 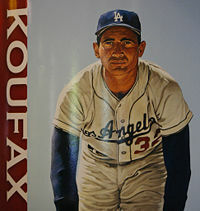 Koufax finished the year 18–13 with 269 strikeouts and 96 walks. In 1962, the Dodgers moved to their new ballpark, Dodger Stadium. In contrast to the Los Angeles Coliseum, the new stadium was a pitcher-friendly park. Partly as a result of this, and also due to his improved control, Koufax lowered his home ERA from 4.29 to 1.75. On June 30 against the New York Mets, Koufax threw his first no-hitter. In the first inning of the game, Koufax struck out three batters on nine pitches. That same season, Koufax's pitching hand was injured during a batting attempt. The injury did not seem to affect his pitching, however, so he ignored the problem. By July his entire hand was becoming numb and he had to leave some games early. A vascular specialist determined that Koufax had a crushed artery in his palm. Ten days of experimental medicine successfully reopened the artery, and Koufax finally was able to pitch again in September, when the team was locked in a tight pennant race with the Giants. Out of form after a long layoff, Koufax was ineffective in three appearances as the Giants caught the Dodgers at the end of the regular season, forcing a three-game playoff, which the Dodgers lost in the last inning of the deciding third game. Koufax came roaring back in 1963. On May 11, he pitched his second no-hitter, facing a powerful Giants lineup, including future Hall of Famers Willie Mays, Willie McCovey, and Orlando Cepeda. He finished the year by winning the pitchers' Triple Crown and leading the Dodgers to the pennant. He won the NL MVP Award, the Cy Young Award (its first unanimous choice), and the Hickok Belt, awarded to the top professional athlete of the year. The Dodgers faced the New York Yankees in the 1963 World Series, where Koufax beat Whitey Ford 5 - 2 in Game One and struck out 15 batters, breaking Carl Erskine's record of 14 strikeouts in the 1953 World Series. Yogi Berra, after seeing Koufax's Game-One performance, was quoted as saying, "I can see how he won 25 games. What I don't understand is how he lost five." In Game Four, Koufax completed the Dodgers' series sweep of the Yankees with a 2-1 victory over Ford, earning the World Series MVP Award for his performance. The 1964 season started with great expectations. On April 18, Koufax struck out three batters on nine pitches in the third inning of a three-to-nothing loss to the Cincinnati Reds. On April 22, however, against the St. Louis Cardinals, he felt something "let go" in his arm. Koufax ended up getting three cortisone shots for his sore elbow and he missed three starts. Nevertheless, on June 4, playing at Connie Mack Stadium against the Philadelphia Phillies, Koufax pitched his third no-hitter in three years, becoming only the second pitcher of the modern era (after Bob Feller) to pitch three no-hitters. On August 8, Koufax jammed his pitching arm while diving back to second base to beat a pick-off throw. He managed to continuing pitching and to win two more games. However, the morning after his nineteenth win, a shutout in which he struck out 13, he could not straighten his arm. He was diagnosed by Dodgers' team physician Robert Kerlan with traumatic arthritis. Koufax still finished the year with an impressive 19-5 record. The 1965 season started off badly for Koufax. On March 31, he awoke to find that his entire left arm was black and blue from hemorrhaging. After consulting his doctor, Koufax agreed not to throw at all between games—a resolution that lasted only one start. To get himself through the games he pitched in, he resorted to Empirin with codeine for the pain and Butazolidin for inflammation. He also applied capsaicin-based Capsolin ointment before each game, and then soaked his arm in a tub of ice. On September 9, 1965, Koufax became the sixth pitcher of the modern era to throw a perfect game. The game was Koufax's fourth no-hitter, setting a Major-League record (subsequently broken by Nolan Ryan). The game also featured a quality performance by the opposing pitcher, Bob Hendley of the Cubs, who himself pitched a one-hitter and allowed only two batters to reach base. The game's only run, scored by the Dodgers, was unearned, scored when Lou Johnson walked, reached second on a sacrifice bunt, stole third, and then scored when the throw at third went wild. Despite the constant pain in his pitching elbow, Koufax pitched 335 and two-thirds innings and led the Dodgers to another pennant. He finished the year by winning his second pitchers' Triple Crown, leading the league in wins (26), ERA (2.04), and strikeouts (382). His strikeout total set a modern (post-1900) record that lasted until 1973, when Nolan Ryan struck out 383 batters. Koufax held batters to 5.79 hits per nine innings and allowed the fewest base runners per nine innings in any season ever: 7.83, breaking his own record of 7.96. He captured his second Cy Young Award, again unanimously. He had 11-game winning streaks in both 1964 and 1965. Koufax and the Dodgers faced the Minnesota Twins in the 1965 World Series. Koufax famously declined to pitch Game One due to his observance of Yom Kippur. With Drysdale pitching, his team was hit hard. In Game Two, Koufax pitched six innings, giving up two runs, but the Twins won the game 5-1. The Dodgers fought back, with Claude Osteen, Drysdale, and Koufax claiming vital wins to take a 3-2 lead back to Minnesota. In game five, Koufax pitched a complete-game shutout, winning 7-0. The Twins won game six to force a seventh game. Starting game seven on only two days of rest, Koufax pitched through fatigue and arthritic pain, throwing a three-hit shutout to clinch the Series. The performance was enough to win him his second World Series' MVP award. Koufax won the Hickok Belt a second time in 1965, the first and only time anyone had won the belt more than once. He was also awarded Sports Illustrated magazine's Sportsman of the Year award. After difficult contract negotiations, both Koufax and Drysdale refused to report to spring training in February 1966. Koufax ended up getting $125,000 and Drysdale $110,000. They rejoined the team in the last week of spring training. Against his doctor's advice, Koufax pitched regularly and ended up with 323 innings pitched and had a 27-and-9 record with a 1.73 ERA. Since then, no left-hander has had more wins, nor a lower ERA, in a season. In the final game of the regular season, the Dodgers had to beat the Phillies to win the pennant. In the second game of a doubleheader, Koufax faced Jim Bunning in the first-ever match-up between perfect-game winners. Koufax, on two days rest, pitched a complete-game 6-2 victory to clinch the pennant. The Dodgers went on to face the Baltimore Orioles in the 1966 World Series. Game two marked Koufax's third start in eight days. He pitched well enough, but three errors by Dodger center fielder Willie Davis in the fifth inning produced three unearned runs. Baltimore's Jim Palmer pitched a four-hitter and the Dodgers ended up losing the game 6-0. The Dodgers were swept in four games, not scoring a single run in the last three. After the World Series, Koufax announced his retirement due to his arthritic condition. Whereas many left-handed pitchers throw with a three-quarter or sidearm motion, Koufax threw with a pronounced over-the-top arm action. This may have increased his velocity, but reduced the lateral movement on his pitches, especially movement away from left-handed hitters. Most of his velocity came from his strong legs and back, combined with a high-kicking wind-up and an extremely long forward stretch toward the plate. Throughout his career, Koufax relied mostly on two pitches. His four-seam fastball had a "rising" motion due to underspin, while his overhand curveball, spun with the middle finger, dropped vertically 12 to 24 inches due to his arm action. He also occasionally threw a changeup and a forkball. In 1967, Koufax signed a ten-year contract with NBC for $1 million to be a broadcaster on the Saturday Game of the Week. Never feeling comfortable in front of the camera, he quit after six years, just prior to the start of the 1973 season. Koufax married Anne Widmark, daughter of movie star Richard Widmark, in 1969; the couple divorced in the 1980s. He then remarried and divorced again in the 1990s. In his first year of eligibility in 1972, Koufax was elected to the Baseball Hall of Fame, just weeks after his thirty-sixth birthday. His election made him the Hall's youngest member ever, five months younger than Lou Gehrig upon his induction in 1939. On June 4 of that same year, Koufax's uniform number 32 was retired, alongside those of Dodger greats Roy Campanella (39) and Jackie Robinson (42). The Dodgers hired Koufax to be a minor-league pitching coach in 1979. He resigned in 1990, saying he was not earning his keep, but most observers blamed it on his uneasy relationship with manager Tommy Lasorda. Koufax was selected for seven All-Star games and was the first pitcher to win multiple Cy Young Awards, as well as the first pitcher to win a Cy Young Award by a unanimous vote; all three Cy Young Awards he won were by unanimous vote. 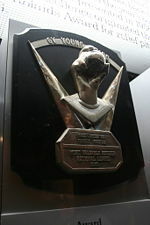 More impressive yet, during Koufax's career there was only one such award given out annually, while since 1967, the year after Koufax retired, Cy Young Awards have been given to pitchers in both the National and American Leagues. A notoriously difficult pitcher for batters to face, he was the first major leaguer to pitch more than three no-hitters (including the first perfect game by a left-hander since 1880), to average fewer than seven hits allowed per nine innings pitched in his career (6.79; batters hit .205 against him), and to strike out more than nine batters (9.28) per nine innings pitched in his career. He also became the second pitcher in baseball history to have two games with 18 or more strikeouts, and the first to have eight games with 15 or more strikeouts. He is also on the very short list of pitchers who retired with more career strikeouts than innings pitched. In his 12-season career, Koufax had a 165-87 record with a 2.76 ERA, 2,396 strikeouts, 137 complete games, and 40 shutouts. He and Juan Marichal are the only two major-league pitchers in the post-war era (1946 to date) to have more than one season of 25 or more wins; each posted three such seasons. His World-Series ERA was an amazing 0.95. In 1999, The Sporting News placed Koufax at number 26 on its list of "The 100 Greatest Baseball Players." That same year, he was named as one of the 30 players on the Major League Baseball All-Century Team. ↑ Sandy Koufax Biography, ESPN.com. Retrieved February 24, 2009. All links retrieved June 26, 2014. This page was last modified on 26 June 2014, at 14:42.